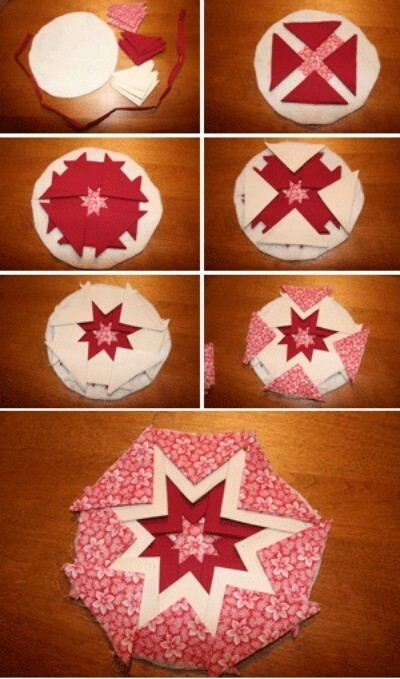 Use those scraps of material for a quilted potholder. Approximate Time: At least an hour. Cut all your materials to the "rough" inch dimensions. Locate the center of the blanket circle and lay the 2 inch scrap of material there. Pin four 4 inch squares of material that you have folded into triangles. Sew down. Then remaining four over the first and sew. Row one completed. Row two is 1/2 inch back from the points of row 1. Sew the first four over the original four you sewed, then sew the remaining four to complete the row. Sew row 3 3/4 of an inch back from the points of row 2 in the same manner. Trim the edges of the triangles to match the circle of blanket. I use a hand crank sewing machine, so I hand sew the seam binding onto the material. Your potholder is now ready to use, give as a gift and always machine washable. those are beautiful! thanks for putting up this great tutorial. a couple of years ago a friend made new curtains for her kitchen and gave me the leftover fabric (blue gingham print and white on white print). it sat in my stash till this year. i made two hotpads for her from this pattern for her birthday. i reversed the order of the fabrics so one is blue with white and the other white with blue. actually, i finished hand sewing the binding while we traveled to her mother's calling hours and funeral (it was hard with all the tears i had to keep wiping away). she loved them and, of course, said she won't use them because they are "too nice". i had to remind her that they can be washed!! for christmas i'm using the balance of the fabric to cover a composition notebook for a cookbook and to make matching cloth napkins. remember, the gift is your talent. anyone can buy something that was mass produced. the most meaningful gifts come from YOU not the store. This pattern has raw edges in all the center, that will ravel when washed. Not a good design. Please reply. Thanks.